NIR is a full-service mechanical contractor, providing service and repair of all types and brands of HVAC, industrial refrigeration and mechanical equipment for your business. 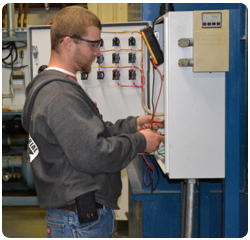 We install new equipment as well as provide custom fabrication of existing or new equipment specific to your needs. NIR also offers maintenance programs to keep your heating and cooling equipment running smoothly and efficiently. NIR is committed to upholding the highest level of service and installation in the heating, air conditioning and refrigeration industry. We are dedicated to providing the best possible products, unsurpassed quality and the best professional service in the industry. Trust and quality HVAC workmanship are why Nebraska Industrial Refrigeration has been successful in doing business over the past 11 years. Our philosophy is to build a LONG TERM, trusting relationship with every customer. Professional commercial heating and air conditioning repair service is provided with the ability to work together with customers as partners in business. NIR has the ability to custom design refrigeration equipment, design kitchens all based on your needs and services. We offer routine maintenance programs, which are custom tailored to meet your individual needs. Our customers are our most valuable assets. We take great pride in our ability to provide you with professional technicians that are experienced and knowledgeable. NIR offers competitive pricing, free estimates and 24/7 service.